Orthodontics deals with the growth of jaws, dentition and the diagnosis and treatment of anomalies that may occur. Orthodontics deals with the growth of jaws, dentition and the diagnosis and treatment of anomalies that may occur. A phase called interceptive and orthopedic orthodontics is reserved for children already around the age of six. This phase is less invasive and more effective than that performed in adulthood or adolescence, laying the foundation for a perfect smile from an early age. 50% of cases involving children aged around 11 or 13 years require orthodontic interventions, which can be effectively prevented by means of an intervention at an early age. We intervene using fixed or mobile orthodontic devices. Such procedures align and move the teeth and underlying bone structures. The fixed devices consist of ceramic or metal attachments and allow for the proper alignment of the teeth by means of a metal arc. 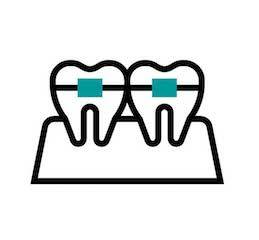 Only the orthodontist can remove them, and they can be fixed externally or internally, thus making them invisible. Removable devices made of resin are fastened by anchoring hooks or screws and expanders. We also use invisible devices, such as masks in transparent material. When it comes to prevention, we work with pediatricians, who can detect the disease within a period of five years. This allows for timely intervention to address normal skeletal development with procedures spaced over long intervals, in order to support natural skeletal development.